Blessed with so many exotic fruits, Colombians go for the obvious option – cook their fruits to preserve them and turn them into pickled deserts. So you have cooked figs eaten with arequipe, cooked guava, and then recently, I came across cooked papayuela. It’s delicious – a chewy texture and a fragrant flavour. While savouring it, I found myself like some of the kids in Hong Kong, who apparently don’t know mangoes come with a big seed since the mango they eat is in big yellow chunks, washed, skinned and cut. And I was eating the papayuela without knowing how it looks or what it is, except that it’s delicious. So, the next time when I saw some papayuela at Surtifruver, my regular greengrocer’s, I bought two of them (not taking on to many since I’d previously made the mistake of not knowing what to do with some of the fruits I’d brought back from the market). Being green and yellow, they look nothing like the papayuela I ate at all, which was red. Yea, I would do anything just for the a good bite! I braved the unknown – I cut up one, and to my surprise, found myself facing some gross white slimy bogey-like paste in the centre! It looked like I was supposed to get rid of it and just chew on the thin outer layer of yellow flesh – which I did. And then here comes my second surprise – it’s sour! I think astringent would be the word. Not particularly nice. Twenty minutes later I found that my lips started itching. It occurred to me that I might be having some kind of reaction against the fruit! And before long my stomach started grumbling. It seemed that my body was rejecting the fruit! I told the locals about my reaction, and they were surprised that I survived that ‘trauma’ because apparently you’re not supposed to eat papayuela raw! (How was I supposed to know!?) And the slimy interior is actually ‘dangerous’ to touch so you’re supposed to wear gloves when you handle the fruit..! I also realised that the reason the delicious papayuela I ate was red was that they had been cooked in panela (raw sugar cane), which explains the color. 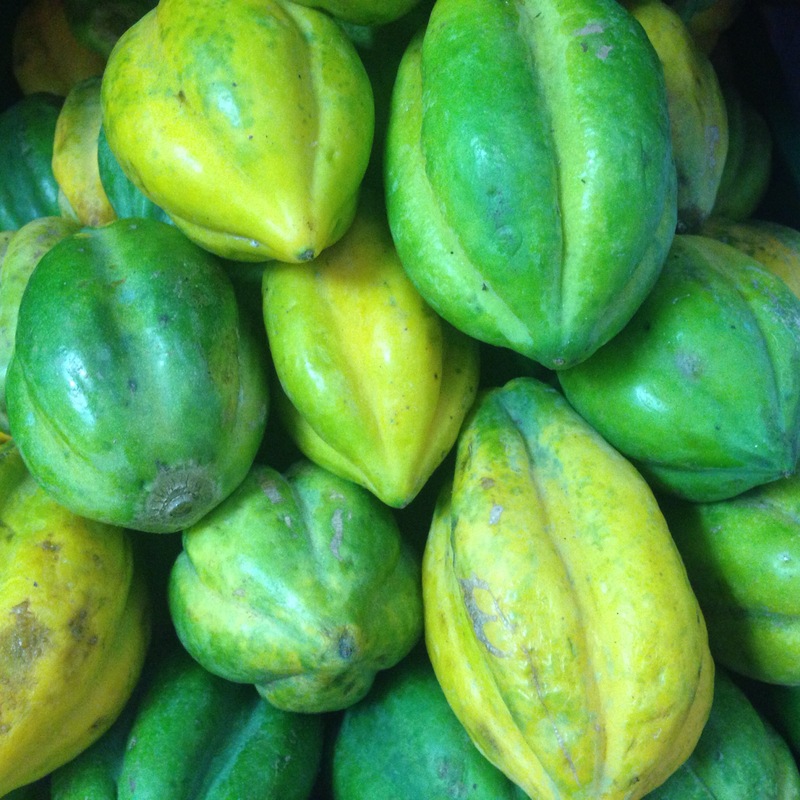 Subsequently I read on wiki that papayuela is a kind of highland baby papaya, except that it looks or tastes nothing like papaya. Remember, go for the cooked stuff if in doubt! ← Where’s the best Pancakes in Bogotá? !